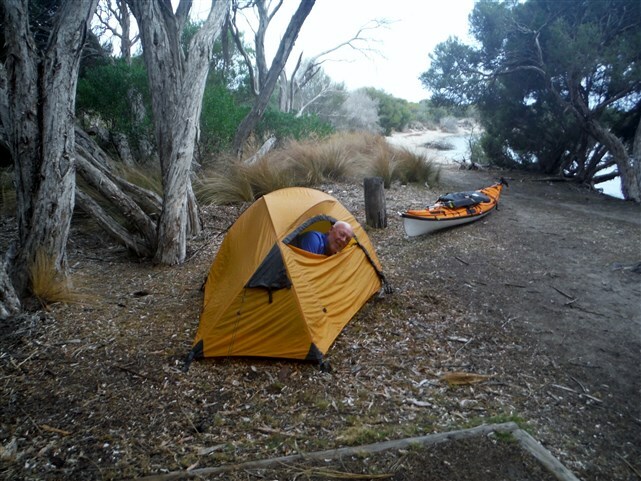 It was a calm Autumn night, although a little warmer than expected as I laid in my sleeping bag on the beach. 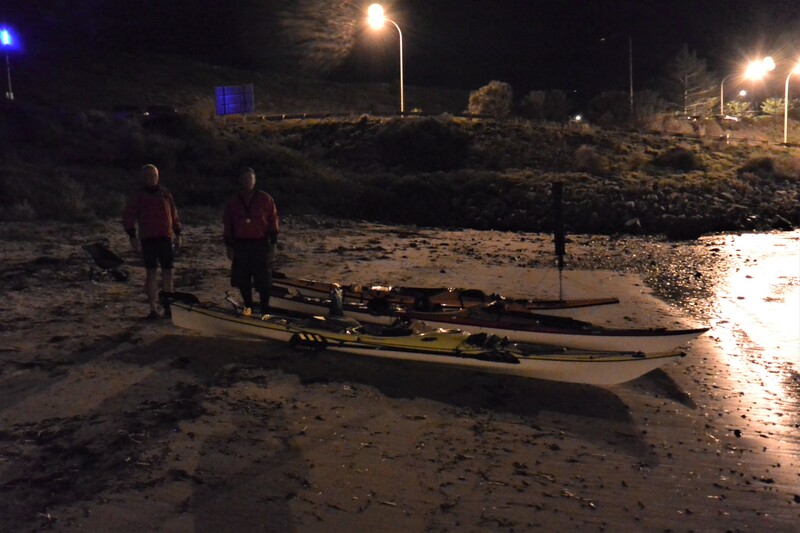 The three of us were scattered around trying to get a few hours sleep before our pre-dawn departure. 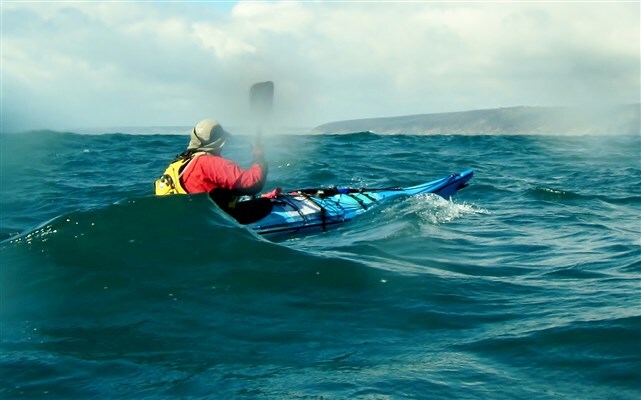 I shut off the phone alarm and checked the latest weather forecast which confirmed calm conditions for today and a light tailwind for tomorrow. 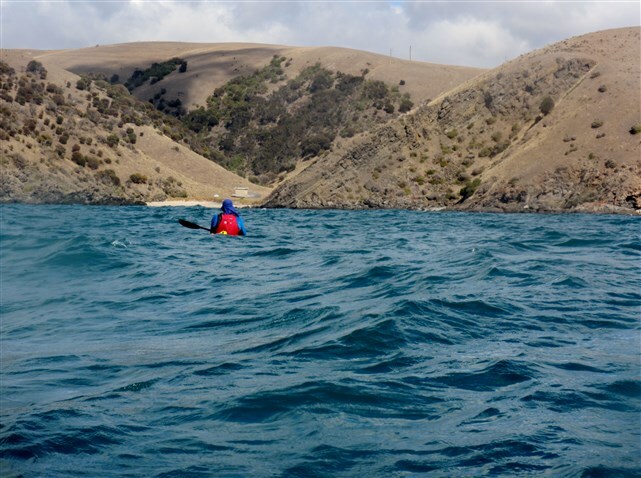 Perfect conditions for Steve’s first 20 km open water crossing of Investigator Strait to Kangaroo Island. 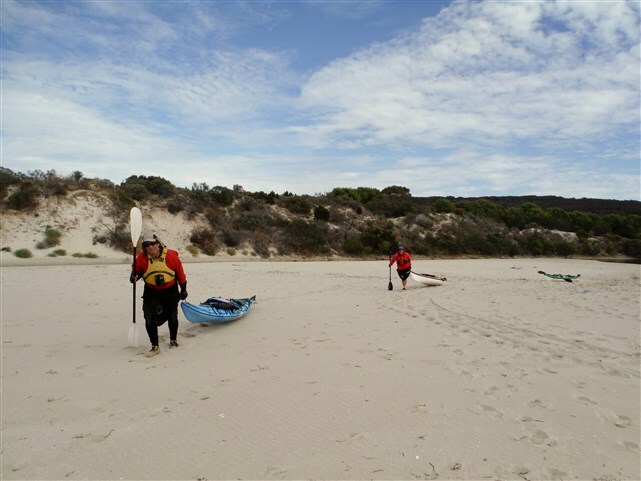 Michael, Steve and I stuffed our kayaks with gear and posed for a photo on the beach. 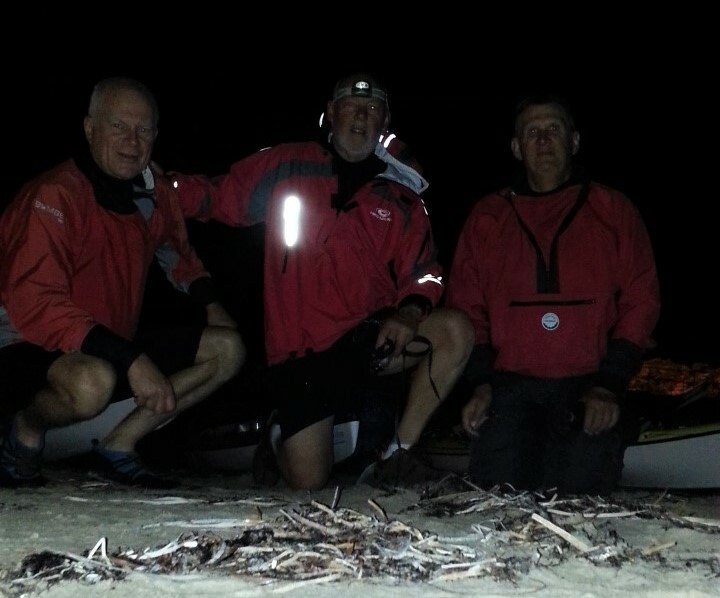 Steve was determined to get a photo with the three of us in, which was not an easy task given the darkness but he succeeded. 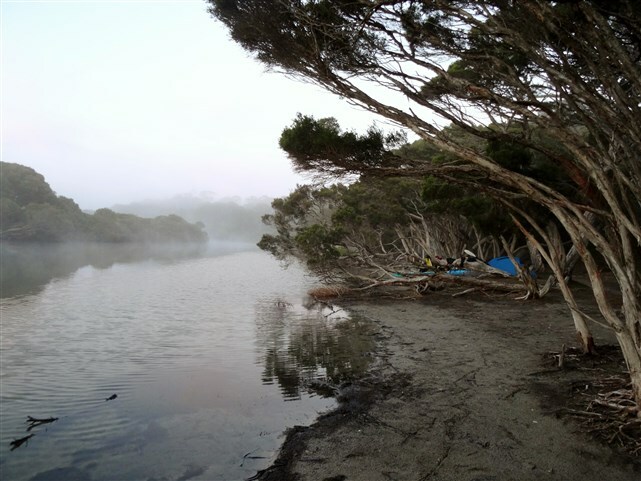 Then it was on the water to clear Cape Jervis before the sun rose. 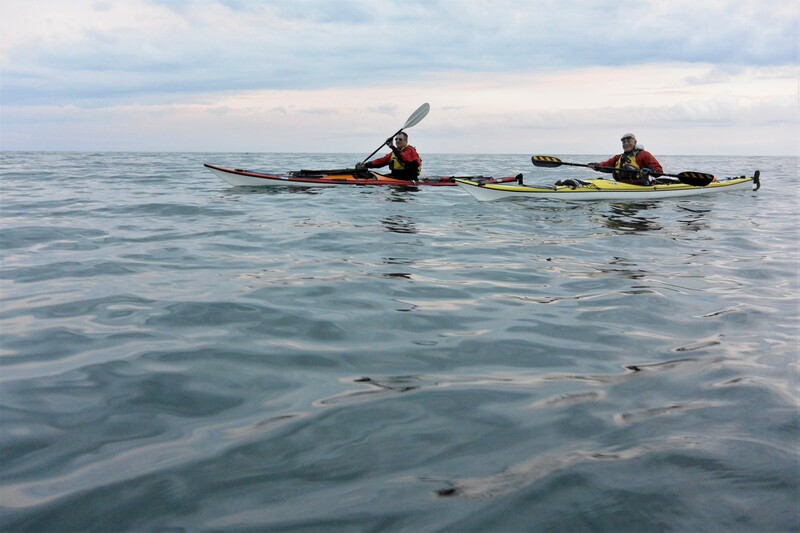 The first couple of kilometers were perfect conditions with almost glassy calm water and the sun peeking through the clouds. 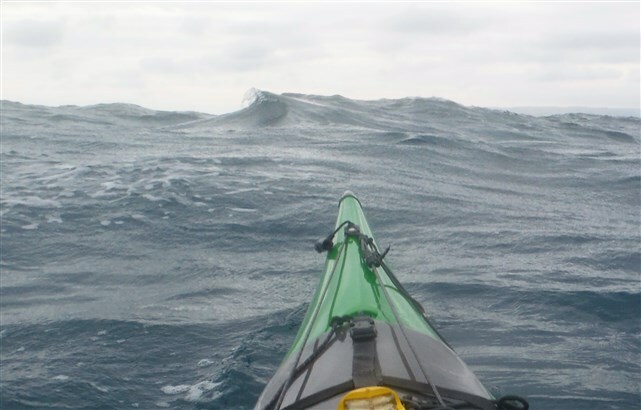 We had checked and double checked the forecasts as there was a strange cloud formation over the island, but all seemed perfect including our speed which was over 8km/hr. 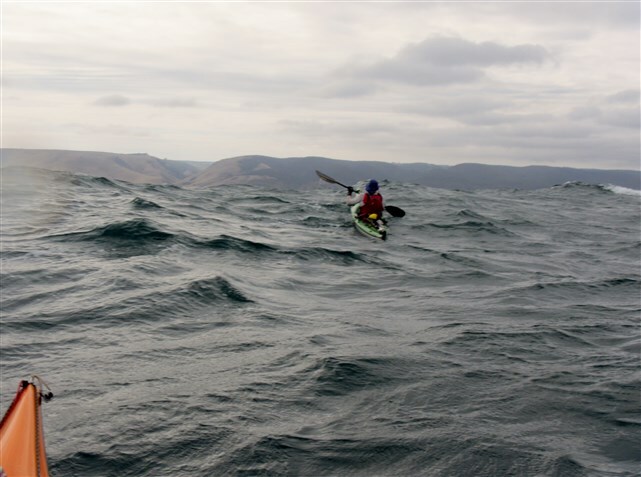 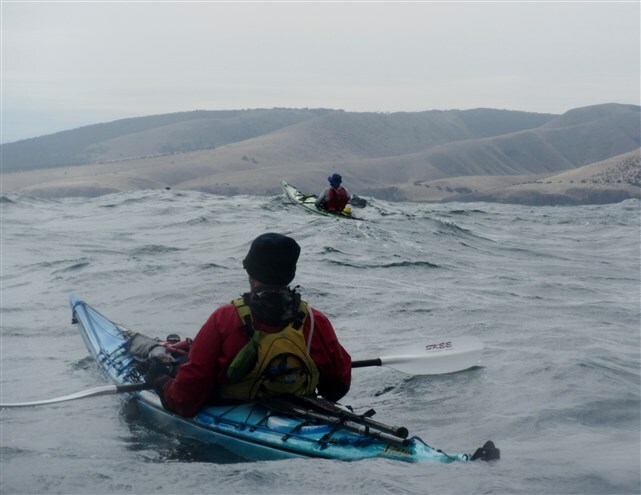 It wasn’t long before we felt a gentle headwind spring up and not much longer before it increased, but our speed was good given the tidal assistance and the laden kayaks easily handled the conditions. 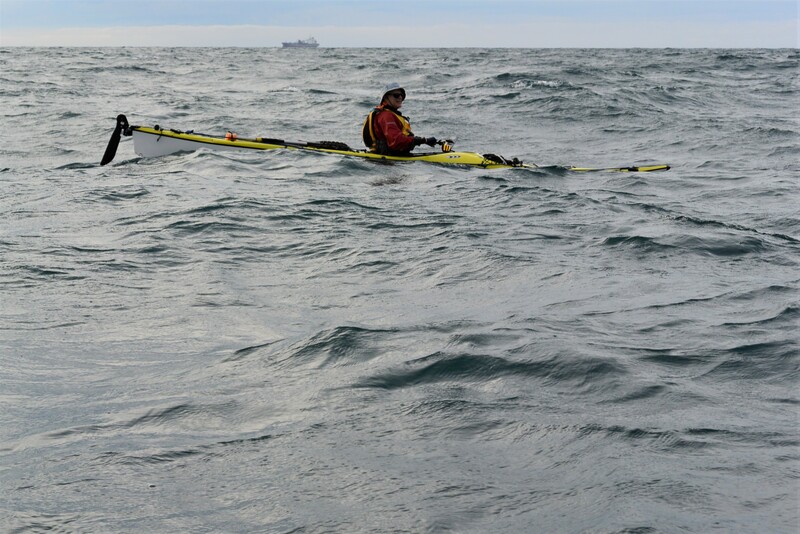 We kept an eye out for traffic as we crossed the shipping channel and this one passed well behind us. 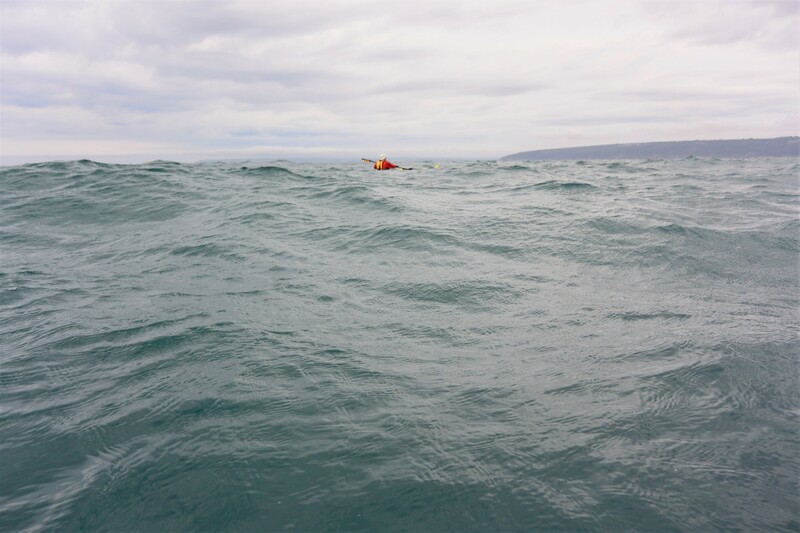 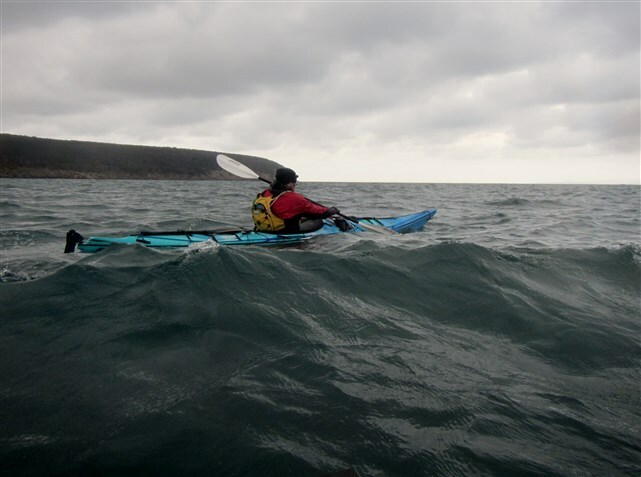 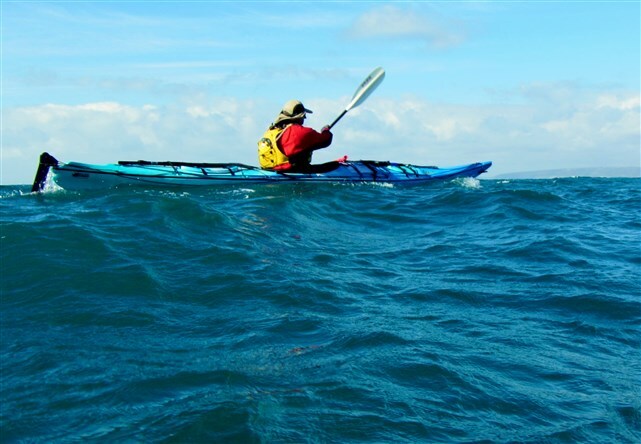 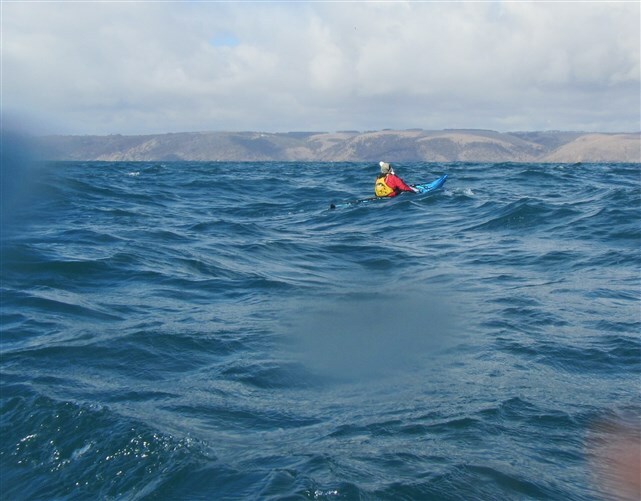 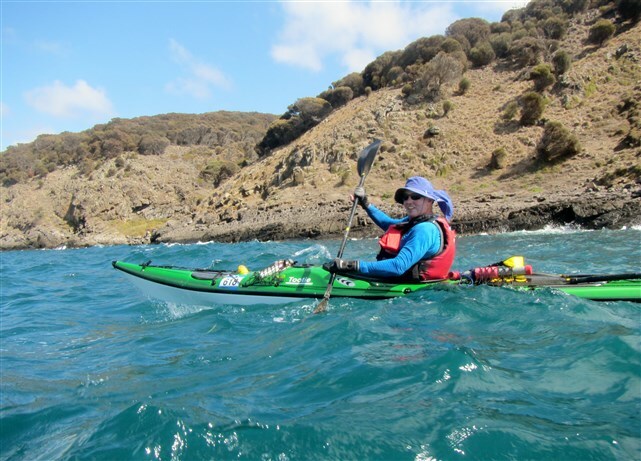 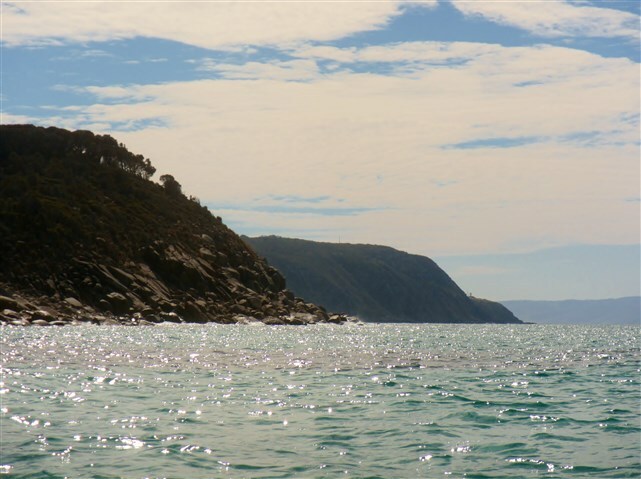 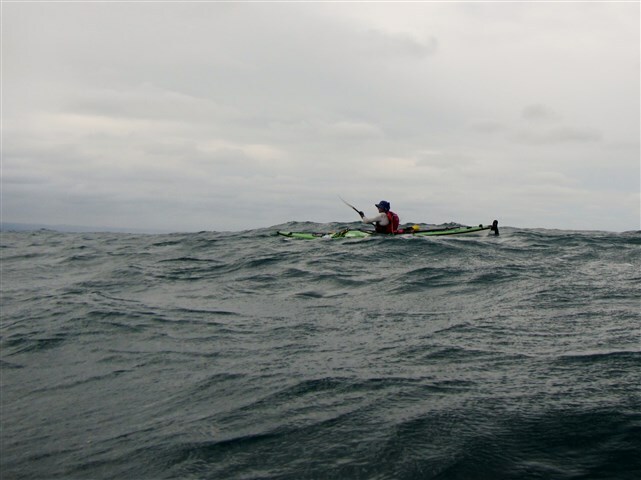 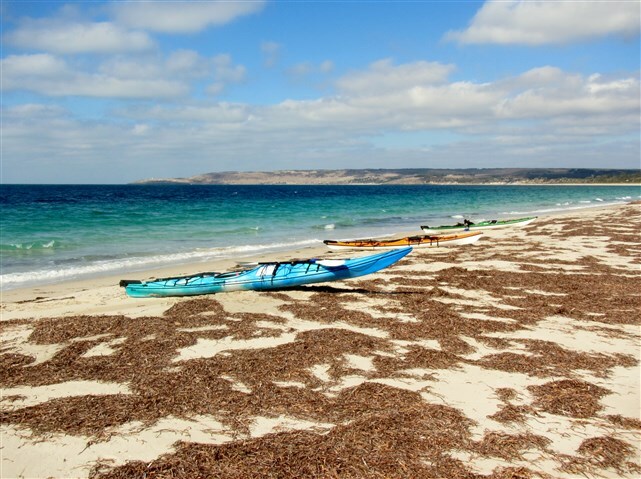 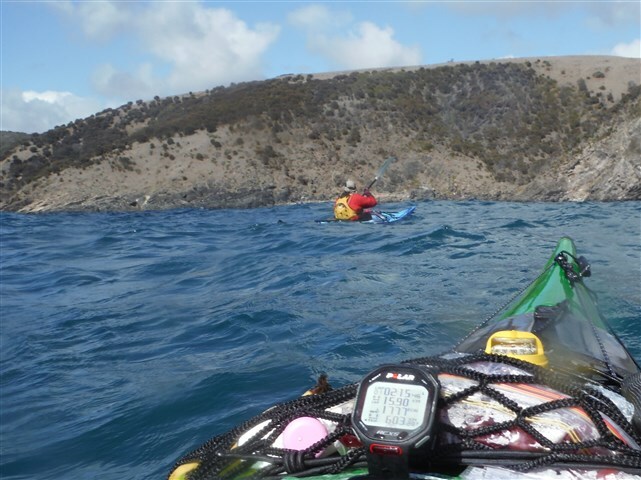 After 3 hours of paddling into the headwind we rested in the wind shadow of the high cliffs of Kangaroo Island, just east of Cuttlefish Bay, with Steve very happy with his first crossing. 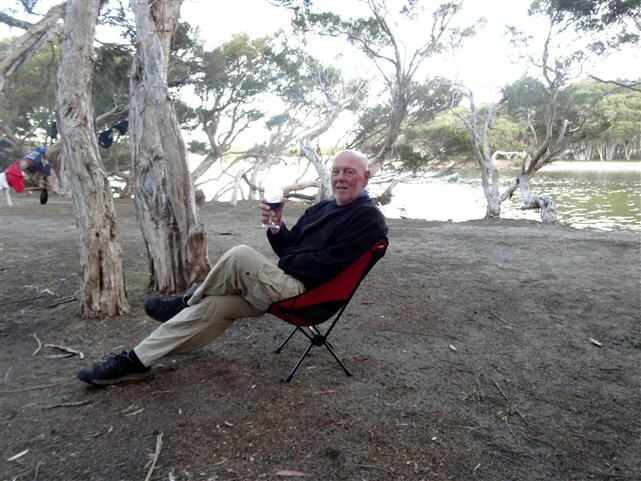 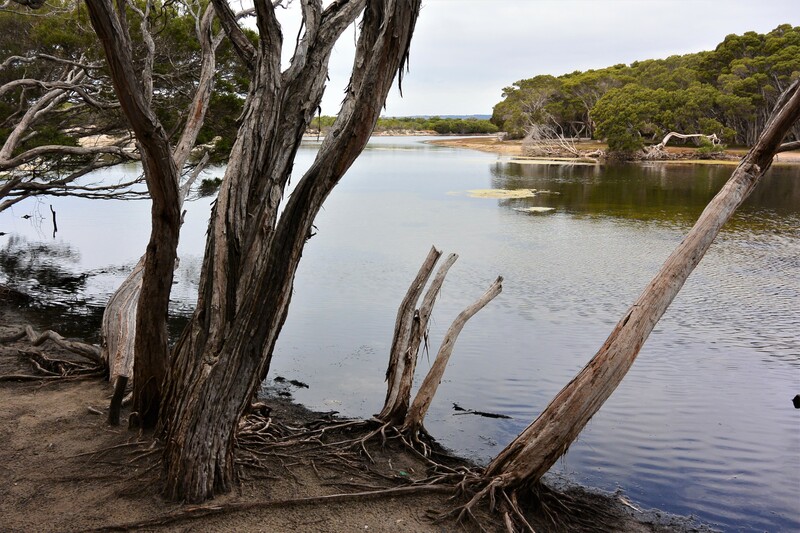 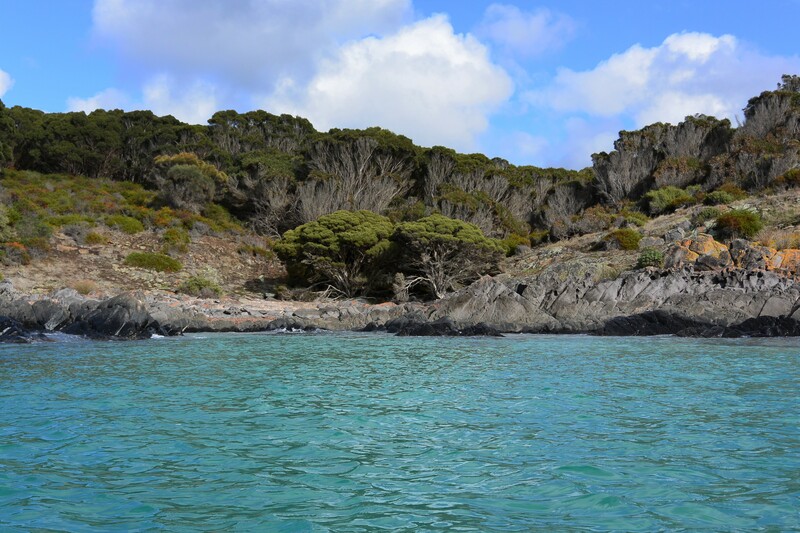 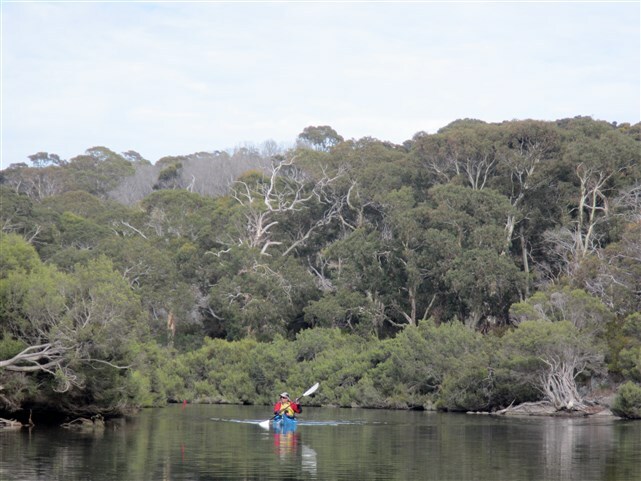 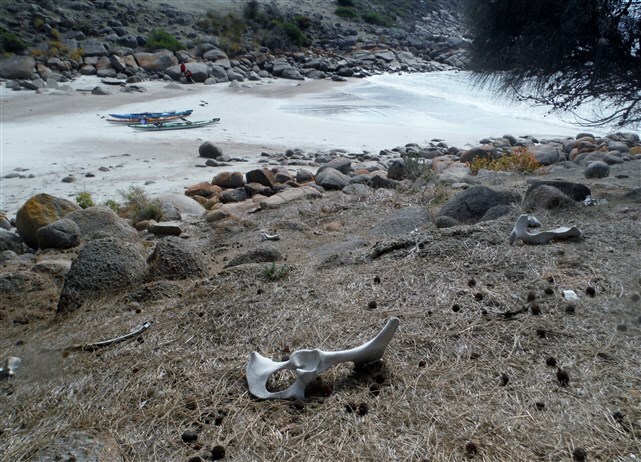 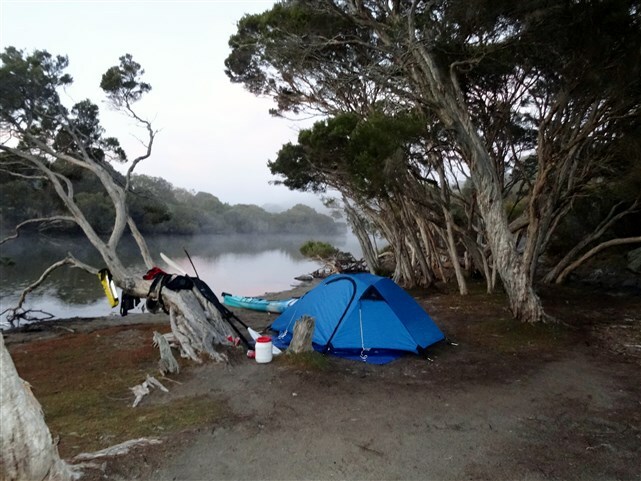 It was then onto our campsite in Antechamber Bay close to the Chapman River. 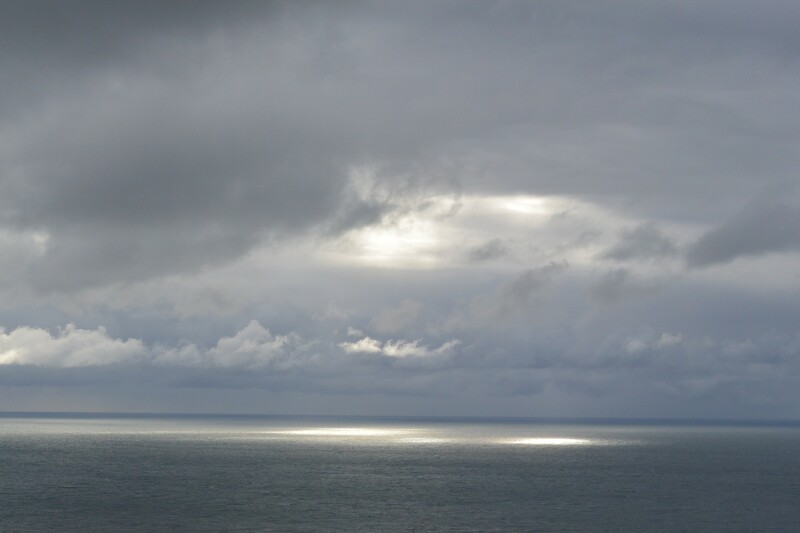 The good weather didn’t last long with heavy rain setting in for most of the day and night. 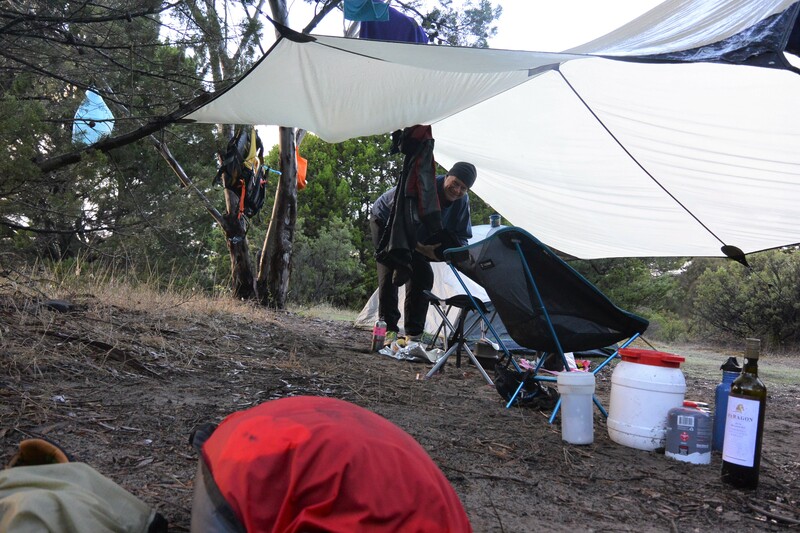 Still we were prepared with shelter and a good bottle of McLaren Vale red wine kindly supplied by Steve. 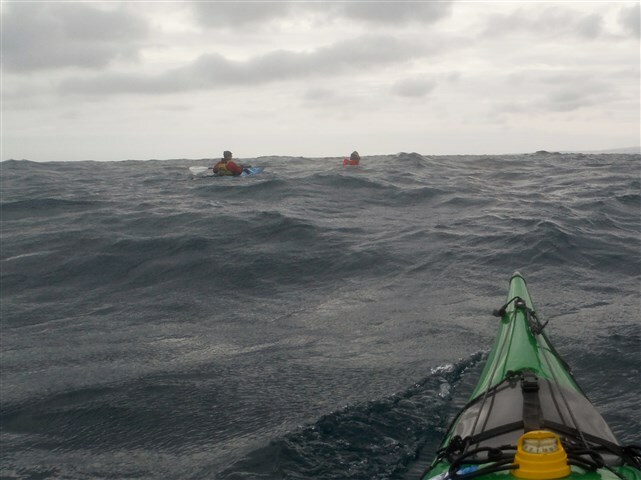 Next morning the rain subsided to occasional light showers as we headed west, hugging the coast to keep out of the wind. 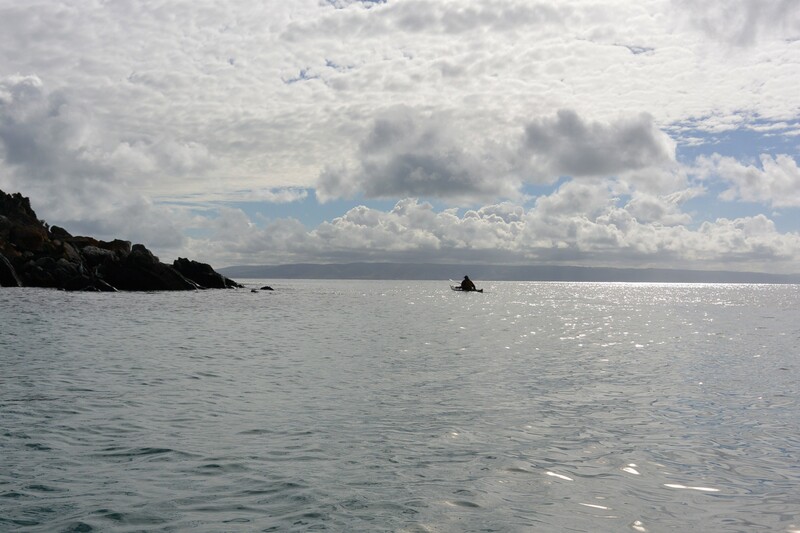 The sun occasionally broke through the clouds lighting up patches of the calm waters in Antechamber Bay. 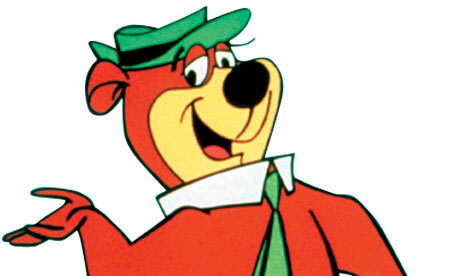 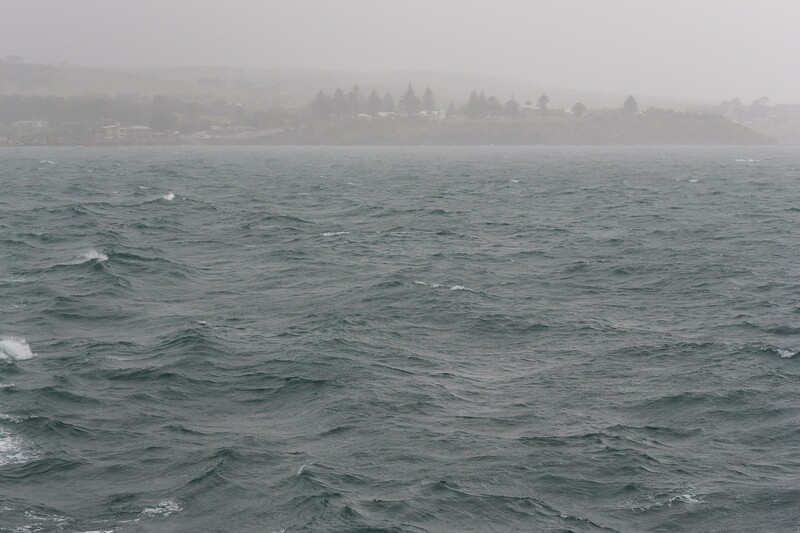 The forecast wasn’t good with a strong wind warning being issued for Investigator Strait and surrounding areas. 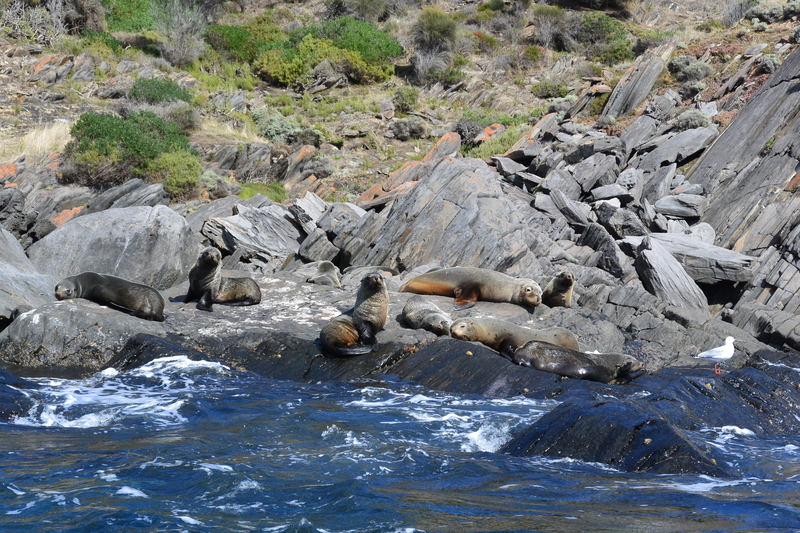 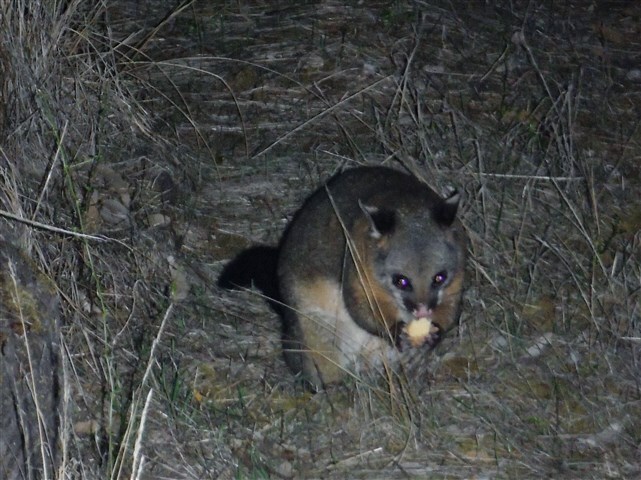 The prospect of 20-30 knot winds was not pleasant so we hugged the coast and dropped in on the local wildlife. 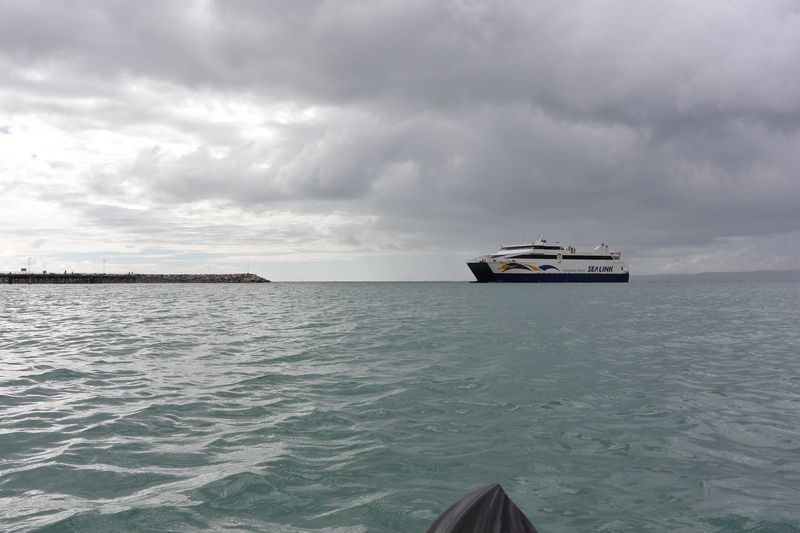 ….and waited to board the “BIG BOAT” that would take us home. 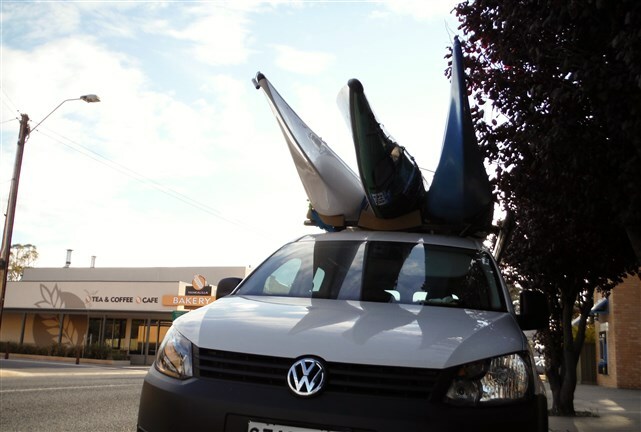 We quickly organised fares and climbed aboard, sandwiched between cars. 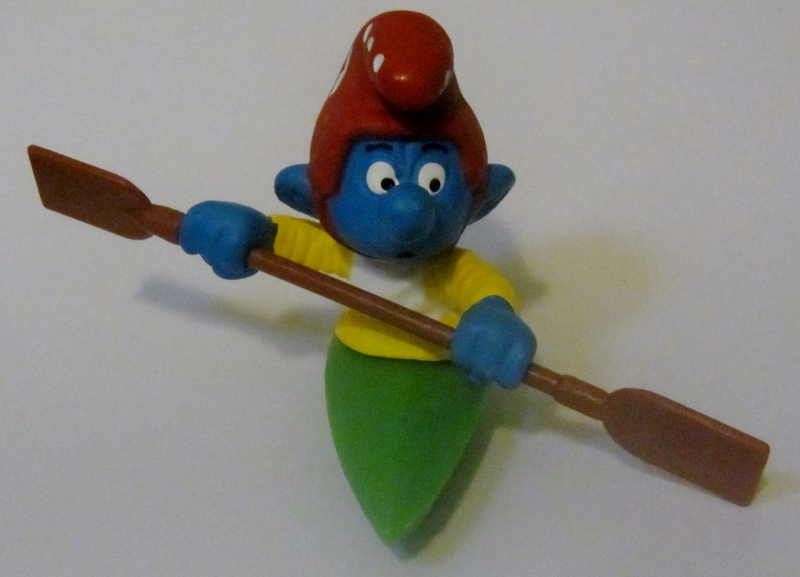 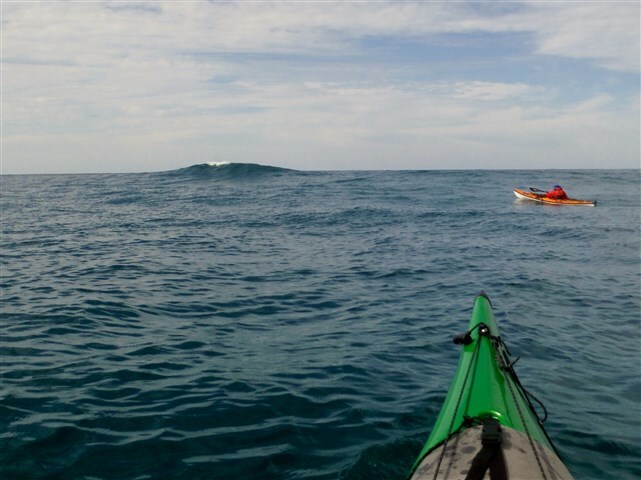 I have been paddling this stretch of water since the early 1980’s and it’s different every time. 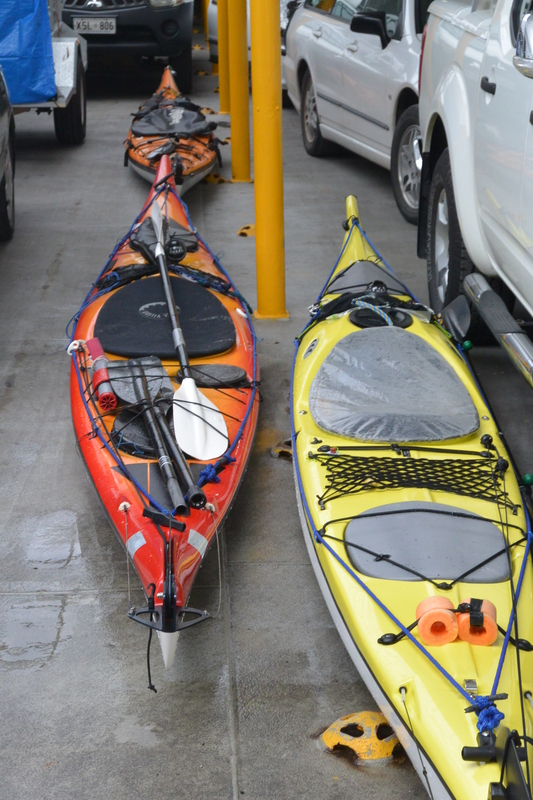 Not only was it Steve’s first crossing of the Strait but the first time Michael and I had come back with our kayaks on the ferry. 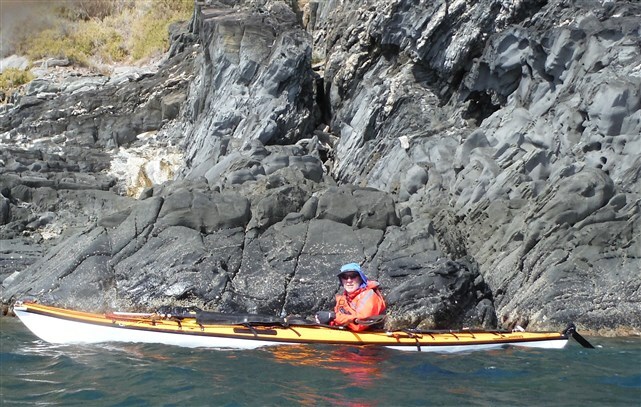 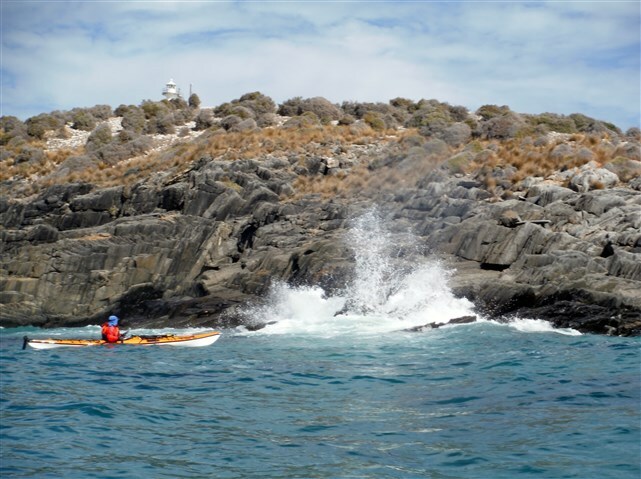 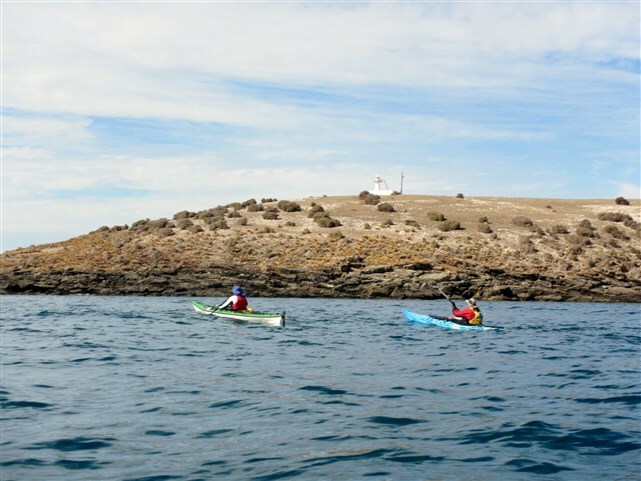 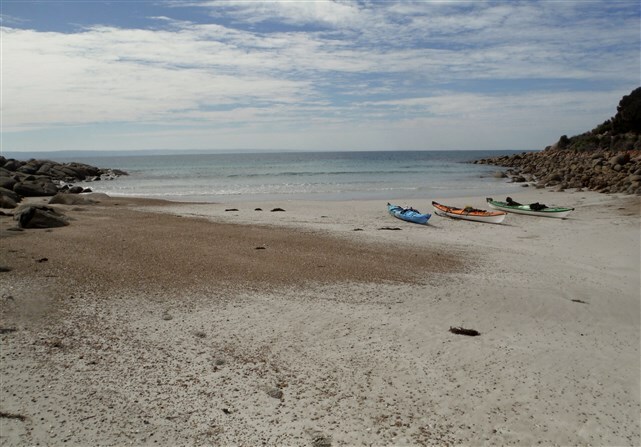 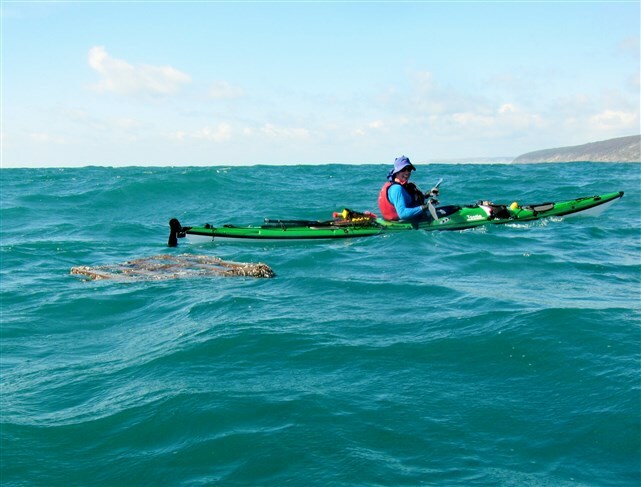 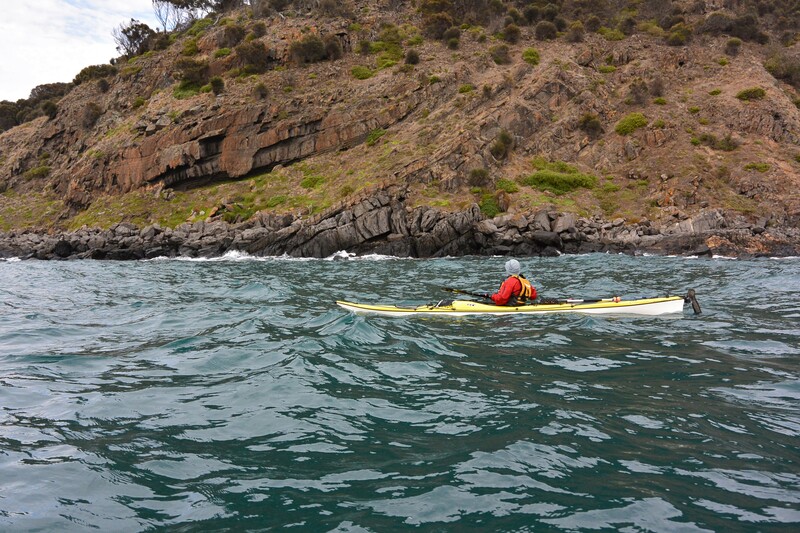 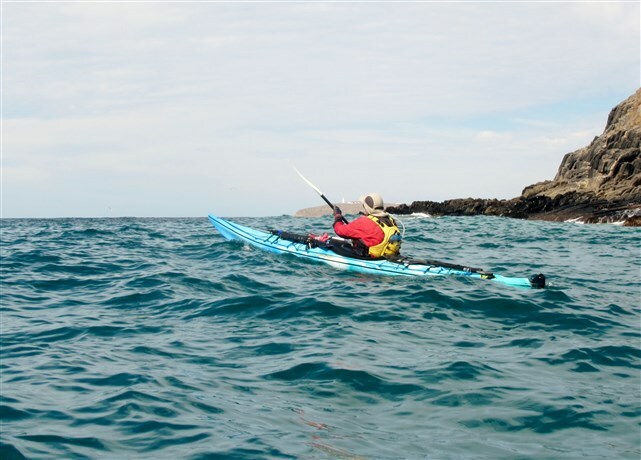 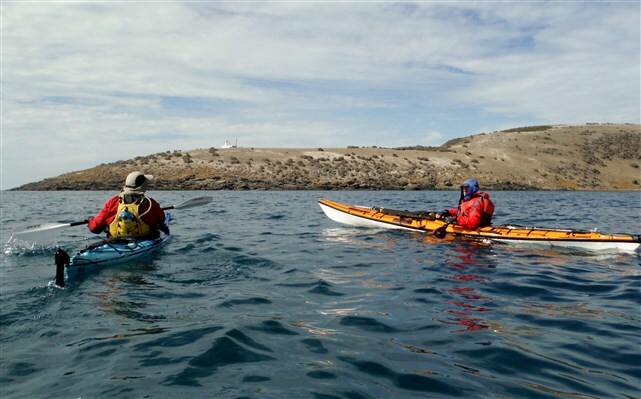 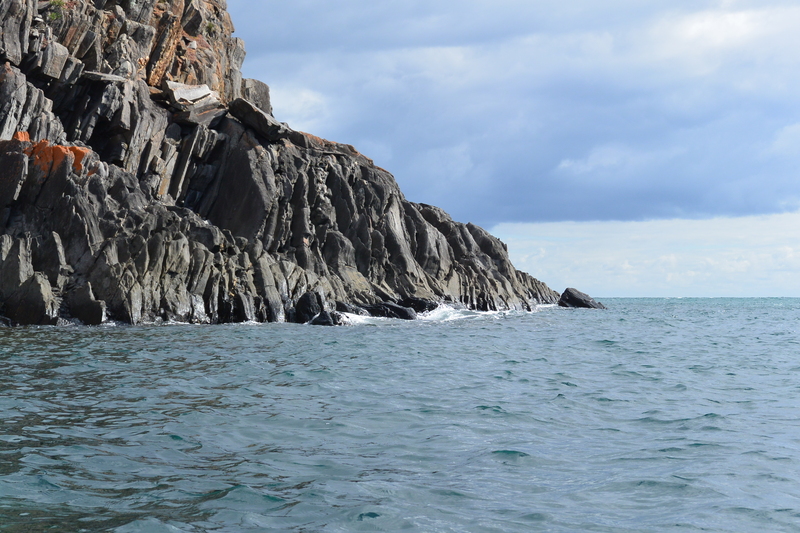 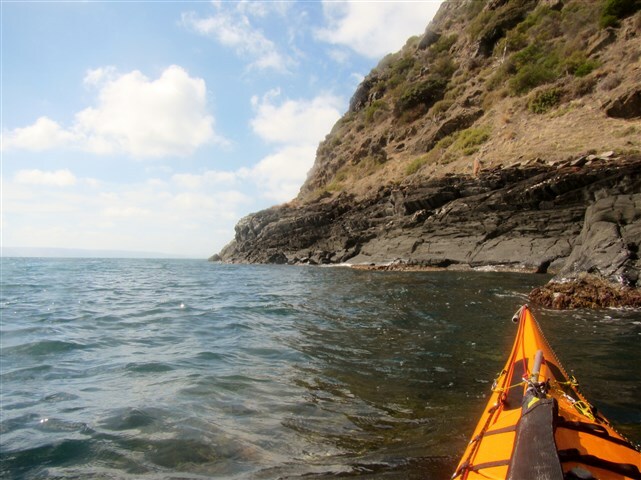 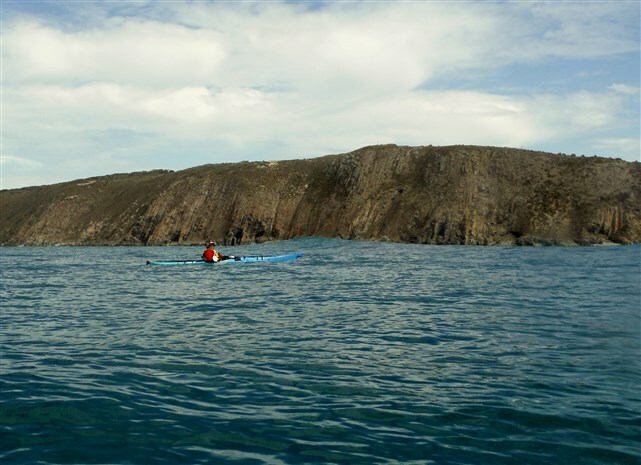 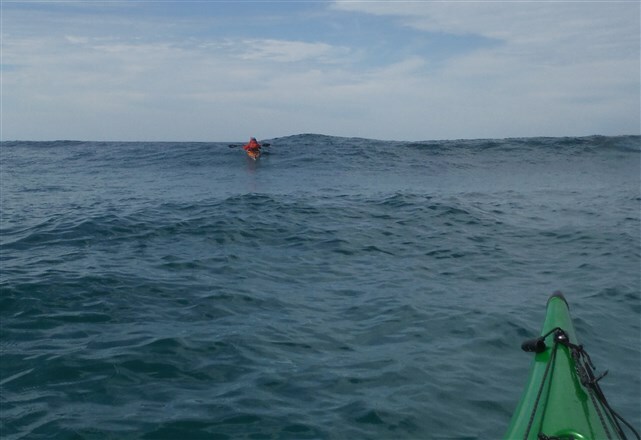 Another great adventure paddling the coast of South Australia.